Hey, you beautiful amazing people out there...today I am going to share my experience of Take Me Back To Brazil - 35 Color Pressed Pigment Palette. Price:- $1800.Availability:- Bh cosmetics website here (they ship internationally). Instagram seller price:- Rs.1800/- approx + shipping. The palette comes in a colorful cardboard packaging. The cardboard is sturdy and sleek. It has a magnetic closure. The palette comes up with a rectangle small mirror. Overall the packaging of the palette gives a strong vibe of Carnival of Brazil. BH Cosmetics is a brand that always comes up with some good quality of makeup. 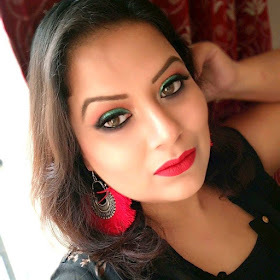 I was a die-hard fan of BH cosmetics during my first phase of blogging but as slowly I started to explore other brands my interest in this brand gradually lost. Bh cosmetics palettes are actually very good palette for those who are beginners in makeup or who don't want to splurge much on makeup. The palette at first glance looks really pretty. I just fall in love with the packaging of the palette. But once I open it I was a little disappointed seeing the size of the pan of the eyeshadows. I was expecting them to be a little bit. Next, I was happy with the color combo in the palette as it has every possible colored shade that one needs in their life. The palette has mixed shades in it. It has both matte and shimmers shades. I was having a tough time while swatching the shades as few matte shades are hard to swatch on my hand. They are a little bit chalky/powdery and so one can notice fallout too. The shades are not so pigmented and so one had to layer it a bit but without any proper eyeshadow base, it hardly shows on my lids. The staying power of this eyeshadows are really low, they hardly stay intact on my lid for 3-4 hours after which I had a feeling that they lighten/fading up a bit. And every shade over shading another one if you have oily lids. Overall BH Cosmetics Take Me Back To Brazil - 35 Color Pressed Pigment Palette is a good palette for beginners only but when you are a pro in eye makeup you will ask for more which the palette failed to show.